I wonder just how far I would go for a game of golf? At the beginning of this week I drove over 1,000 miles to fit in two competitive rounds and, although it was a little draining, it was worth it. On Sunday lunchtime I set off south, bound for a Premier Inn just outside Ascot in Berkshire. Nine hours later I arrived at my hostelry and was pleasantly surprised by its quality. But, the purpose of my visit was not purely to enjoy the simple yet effective lodgings provided by the UK’s largest hotel chain. I was principally there to take part in the Sunningdale Foursomes. I won’t go into great detail because I’ll be covering the experience in depth for the July issue of the magazine. Suffice to say, it was an honour to participate in such a prestigious competition and wonderful, after such a long hard winter, to enjoy playing on a dry and firm course presented in excellent condition. 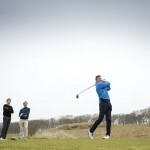 My partner was David Ford who’s general manager of Urban Golf in London and a scratch golfer. I hoped his solid driving and excellent short game would act as a splint for my fragile form. Our first match (after a practice round on Monday) was at 9.42 on Tuesday morning. Unfortunately the splint could only do so much and by 1.00pm on Tuesday we were no longer in the Sunningdale Foursomes. Disappointed, though rejuvenated by a hearty lunch, I considered my options. 1 – Return to my Premier Inn, request a “table for one” for the third straight evening and have another early night. 2 – Get in my car and drive back to Aberdeenshire. Now, given it was already after 4pm and it was 530 miles to my Scottish home, option two was not particularly sensible. But, the second round of the Alliance Championship was at Cruden Bay on Wednesday and I was only five shots off the lead following round one. A quick phone call to Alliance secretary Ron and I’d been reinstated in the competition and had secured a time for 12.00. The drive home was something of an endurance test. I got through three cans of “Red Bull” and enough “Sour Snakes” to make my gums raw. The low point came just after Carlisle at about 9pm. I’d been counting the miles to the border and felt elated as I passed the welcome to Scotland sign – I was almost there. But I was quickly deflated after whizzing past another sign declaring it was 95 miles to Glasgow. It’s at least two hours from Glasgow to my house, and it was 95 miles away. I began attacking the “Sour Snakes” with extra vigour. Those last couple of hours were a little hazy, but the thought of teeing it up at Cruden Bay the next morning kept me trucking northward. I got home at 1.30am and, after a stiff whisky to try and halt the sensation that I was still in motion, crawled eagerly into bed. I must admit I wasn’t feeling 100% as we made the journey to the coast yesterday morning and, if I’m honest, I was pretty certain I’d struggle. After semi-topping the first tee-shot, I realised I was right. But, even though I limped round in a lacklustre 77, I was glad to be out in the warm(ish) sunshine surrounded by sand dunes. What in the world would I rather be doing?